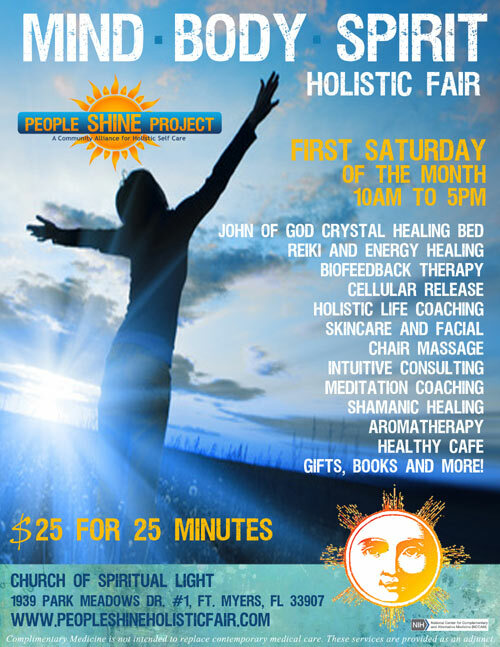 The People Shine Mind-Body-Spirit Holistic Health Fair has emerged through the work and the intention of The People Shine Project, a Southwest Florida Holistic Self Care Alliance that has been providing energy healing, spiritual guidance, mindfulness training, consciousness raising, meditation, yoga, recovery medcine wheel and many other personal growth services to the people of SW Florida since 2008. 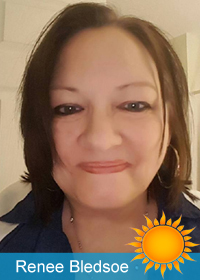 The People Shine Project is provides the umbrella for the community outreach at Church of Spiritual Light, an All Faith, non-denominational church, which was developed by founding minister, Rev. Renee Bledsoe. We are extremely fortunate to have gathered a group of talented respected professionals, who have come together in community, to serve each other and the public through the People Shine Project. Our teachers and guides run the gamut from life coaches, health and wellness coaches, ministers, spiritual teachers, intuitive consultants, meditation masters, to shamanic practitioners, energy medicine practitioners (including Acupunture, Reiki, Theta, Feng Shui, sound and crystal healing),Chinese medicine, massage therapists, ceremonialists, hypnotherapists, plus artists, musicians, yoga and Tai Chi instructors, as well as business and career consultants and marketing experts. 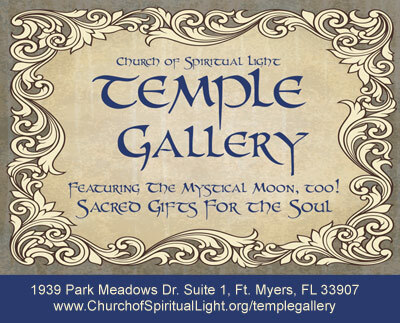 We are very pleased to now offer to the Southwest Florida community yet another avenue to experience the world of energy healing and integrative medicine practices all under one roof.. In no way shape or form do these services invalidate the need or usurp the processes of mainstream and contemporary professional medical care. Any services that are offered at the fair and through the People Shine Project should be a part of a comprehensive health care plan. Please consult with your physician. In 2004 Governor Jeb Bush enacted a Proclamation urging mainstream medical professionals, complimentary (sometimes known as Alternative) practioners, as well as those who are engaging in these services to speak openly and to inform their healthcare providers about ALL of the treatments that they are engaging in. The Proclamation is designed to both acknowledge the billion dollar Alternative healthcare industry, as well as to bring the awareness of it as a means to reducing the overall costs of healthcare for the masses. This is quite a noble endeavor. Given that much of the "evidence" that supports the efficacy of energy medicine is "ancedotal" it becomes increasingly important that patients make their mainstream medical doctors aware of the alternative therapies and practices they are engaged in. You can see the Proclamation here. 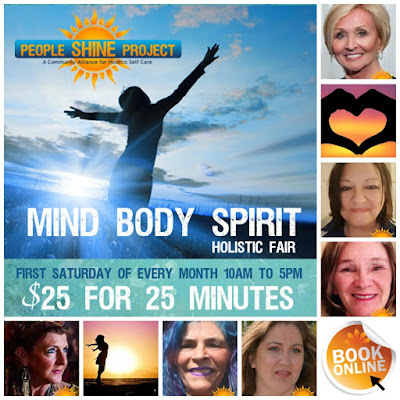 Use the links on the right-hand side of this website to learn more about the offerings at the People Shine MIND-BODY-SPIRIT Holistic Fair. There you'll find brief bio's and descriptions of the services provided.